and we’re back with more ’80s movie goodness for you today! it’s every 30-something’s introduction to the perils of time travel – 1985’s Back to the Future (affiliate link)! 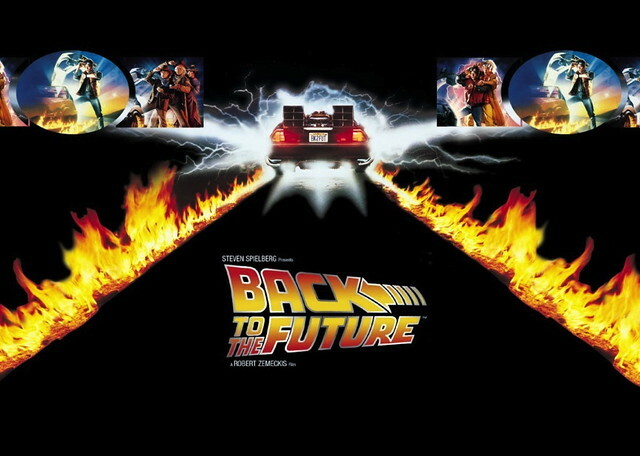 written and directed by Robert Zemeckis, BTTF is the story of Marty McFly, played by a teenage Michael J. Fox, who is accidentally sent back in time to 1955 in his friend Doc Brown’s souped up DeLorean. he must find a way back home while also ensuring his parents (also teens at the time) get together. if he fails in his mission, they will never get married and have him, and he will cease to exist…! and then his mom decides she thinks he’s cute and wants to go to prom with him! also, biff! ohhhhh dear. it’s a super fun movie and a must-watch for an entire generation. 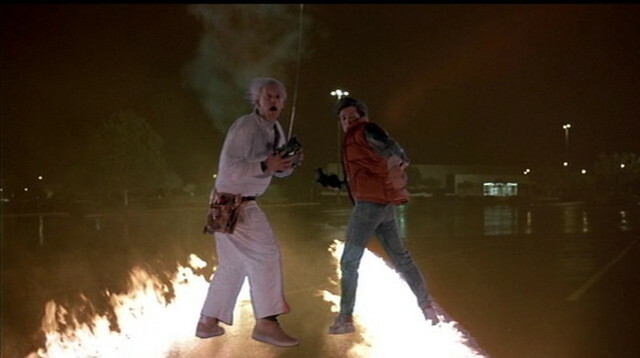 so as far as i’m concerned, there are three true “main characters” in BTTF: Marty, Doc, and The DeLorean. i decided to go more conceptual than i have in film petits past…yep, I totally sewed an outfit inspired by a time traveling car. i actually put an insane amount of thought into trying to bring the vague idea i had in my mind to an outfit that would make sense to everyone, so let’s see if you’re with me, starting with the hair. 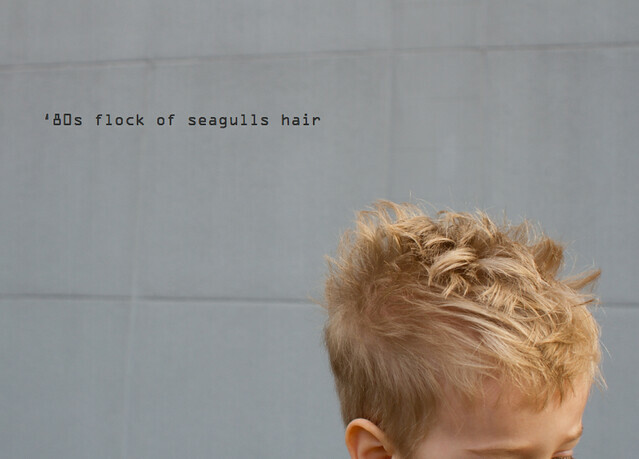 i actually just wanted to point out that i totally spiked up my 2 year old’s hair with pomade so he looked more 80s. okay moving on. if he lifts his arms, it’s even got gull-wing doors! i used Rae’s Flashback Skinny Tee as a base for the jacket, adding room to the neckline, armholes, and chopping off many inches to accommodate the rib knit band at the bottom and the length of the zipper. this is my first time sewing a separating zipper, and the first time sewing taffeta (!) which was the best color gray they had at JoAnn to give me the look I wanted (despite being really impractical for a 2 year old). the final jacket reminds me of Jess’s Drive-inspired jacket, the creation that sparked this whole film petit idea in the first place, so i thought that was cool too! under the jacket is another Flashback Skinny Tee in 3T, which I freezer paper stenciled to look like the OUTATIME license plate on the car! i had a heckuva time figuring out what to put on a shirt, but as soon as I watched the movie again and saw that plate, i pretty much ran to my sewing room to make it. i added stripes to look like the California plate at the top, and i get a feeling he’ll wear this one a lot. 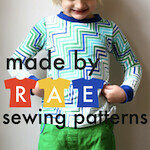 on the bottom, another Rae pattern! 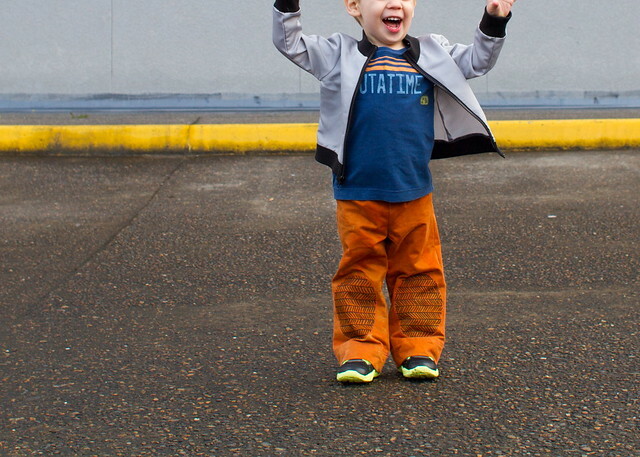 this one is the fab new Parsley Pants pattern (I was a tester). i dyed a pair of my husband’s old khakis ORANGE to look like flame trails the DeLorean leaves behind as it rockets into the past in the parking lot of JCPenny (it was my husband’s idea to do that!). then with a stroke of late night inspiration, i drew tire treads onto the knee patches to nail home the car idea a little more. oh and his neon green-tread shoes represent plutonium fuel. hehe. 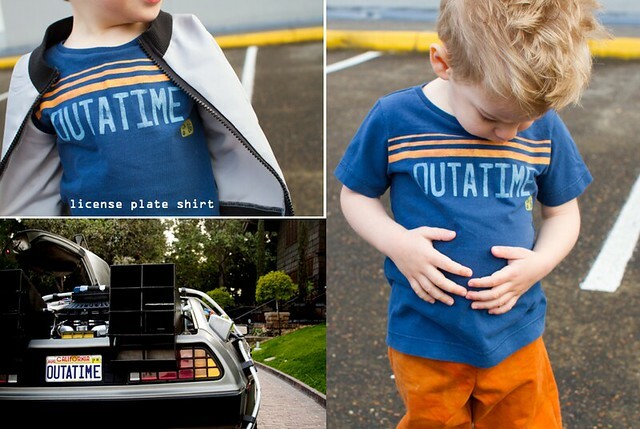 now, you didn’t think i’d make a delorean outfit without a flux capacitor, did you?! of course not. you would never. and there you have it! my little guy says it’s time to go visit our two fellow time travelers and see some amazing and wonderful things. 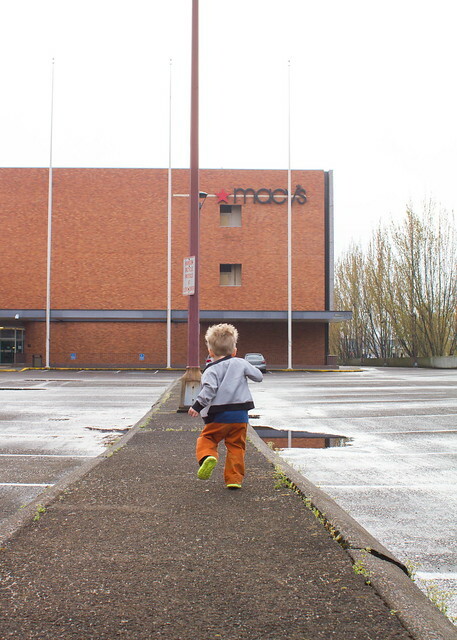 off he goes! won’t you follow him? 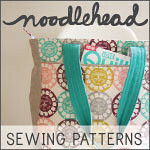 first, i can’t believe that we lured the Queen of All Sewing Bloggers, Dana of MADE, into joining us for film petit! Jess and I were so excited to have her sew with us, and we realized she’s just as much of a procrastinator as we are (score!). 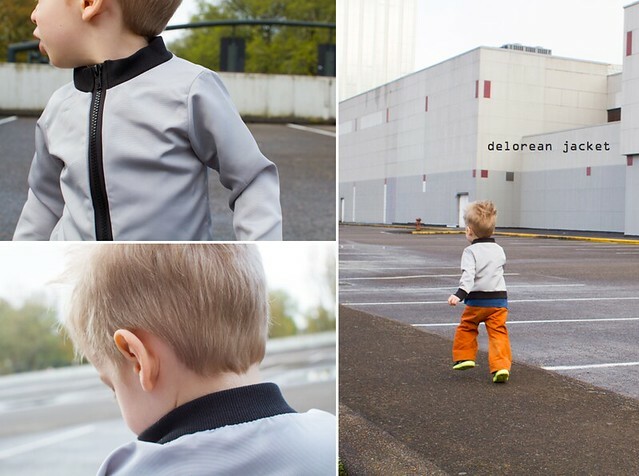 Dana made a super awesome Mary McFly outfit for her son Owen, AND a bonus ’50s girl outfit for her little Clara – both are perfection. GO CHECK IT OUT! thanks for playing, Dana!! aaaaaand my partner-in-crime Jess sewed Doc Brown’s white jumpsuit for her daughter Elsie. yes, daughter. it’s freakin’ hilarious, Jess always gets the silliness just right. GO SEE, GO SEE! every month or so, Jess and i (plus a guest blogger) sew an outfit (or outfits) for our kid (or kids) inspired by a movie we love. 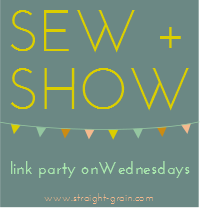 our next guest will be Delia from Delia Creates! 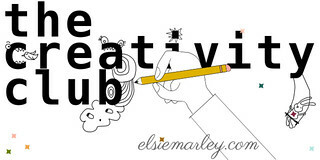 please add your movie-inspired kid sewing to the film petit flickr group. there’s some really amazing stuff in there – we love it when you play along! film petit archives: the life aquatic with steve zissou, amélie, fantastic mr. fox, psycho, moonrise kingdom, ferris bueller’s day off, the big lebowski. you can see all of Jessica’s film petit posts right here. nailed it. And grouted it. oh, I love those back to the future movies, I like that you changed up the colors & you added great details! LOVE!!! I think I have read through this like ten times to really fully absorb & appreciate all the incredible details! Beyond cool! oh, does this ever bring back fun movie memories! Michael J. Fox at his best! :) THis outfit is so clever!! 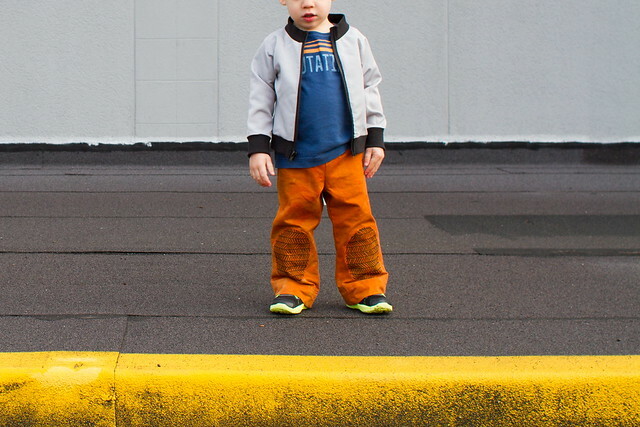 Love the freezer stencil and the tire tread pants patches – great details that really make it the whole outfit shine! Great job!! I want that whole outfit for my kid! So awesome that you nailed the inspiration without going totally literal (I can’t seem to do that)! Love the tag, too. oh geez. a flux capacitor. the license plate tee. you’re so flippin’ awesome I can’t even stand it. I love this outfit! 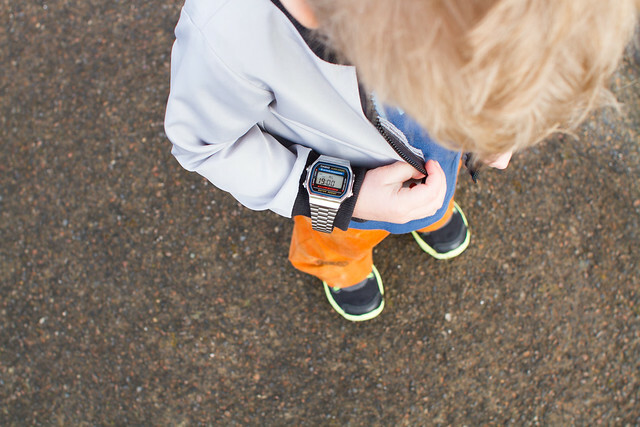 The flux capacitor label, his little 80’s watch, the hair… all of it is total perfection! Too awesome. Too awesome! Love how you interpreted O’s outfit. yup yup, this is awesome!! i like how you went with the overall feel this time, it came out super cool. and orange pants with tire track knee pads?? fabulous!!! Thank you for making me feel a little less crazy about my obsession with this movie! Love it! And I think I might do my own little Film Petit with my son – I purposely cut his hair to resemble George McFly (yep – can you say cray cray?)! Very slick outfit. I especially love the tee and knee pads on the pants! O. M. G. I love this outfit! The pants are amazeballs. Seriously awesome! Love the tire treads, flux capacitor, and the photo shoot! You’re the meaning in my life. You’re my inspiration. You bring feeling to my life. You’re the inspiration. OK. Seriously. Love it all! you are rocking my world with the license plate tee! I REALLLLY want a boy now so I can make him one. Maybe I’ll just make Sadie one anyways. 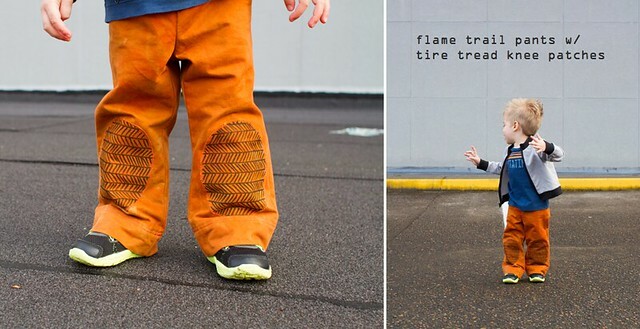 Love the tire tread on the pants, too! 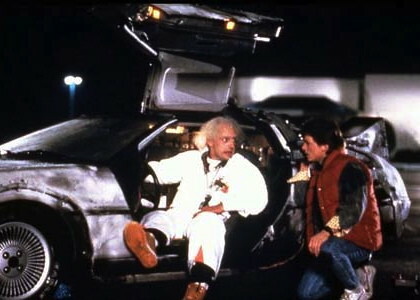 And his jacket looks just like the one Biff is wearing in one of the scenes…Awesome job Kristin!! I enjoy seeing FP! The orange pant with pad is cool, I love it! this is so great! we got all the BTTF movies on bluray for like 20$ at Target when they first came out and had a lot of fun watching them together. Dude, the license plate tee is genius. I’m also glad you modded the flashback into a jacket because I was considering trying to make one into a hoodie. p.s. I just noticed his watch. The tyre tread knee patches are pure gold! Love this take on the car as a character. The jacket rocks, I could use some delorean tile grout! The licence plate tee may just start a new trend! Great job all of you, just discovered your flickr group and threw some in there, although most are Halloween costumes so maybe I should remove them, as this series really isn’t about costumes. LOVE this. The knee patches, the capacitor label, the T-shirt. Too awesome for words, and it makes a really cute outfit. Great job finding a Casio watch too! That turned out so great! The knee patches are my favorite! So cute! Awesome job!!! I love that you went more conceptual this time. Such an incredible outfit! Sweeet! Love that you went less literal this time – this outfit is awesome!! Love the jacket (kinda reminds me of the track jacket I made) and the t-shirt is perfect. I think the tire marked kneepads and FC tag are my fav details 🙂 FUN! I keep coming back to this post, I just can’t get enough of this outfit 🙂 The details are amazing! The whole thing is amazing! EEEK. SO totally great. The flux capacitor!!!! I don’t even know where to begin! Everything is so cool about this outfit. Maybe it is the tire treads on the knees that are the best. 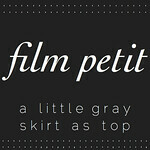 This is my favorite film petit look yet… I love that it is conceptual and I love that you nailed it! Well, this is the first time I am hearing about the series, hence such a late comment – flippin awesome! Back to the future is one of my old time faves! The outfit is amazing! Just love it. 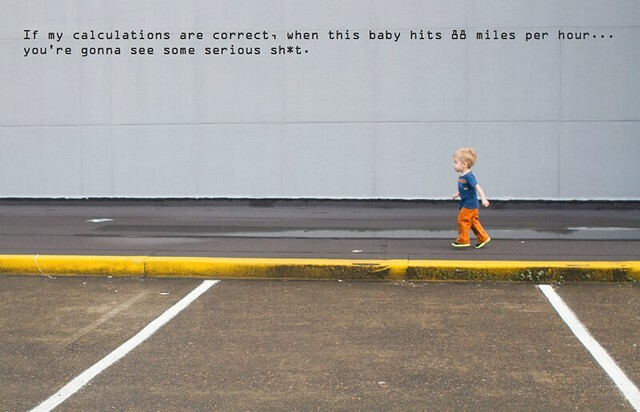 Yeah, when that baby reaches 88 miles per hour… You know 😉 I’d better go see if the series is still running – I want to join in the funnnnn! 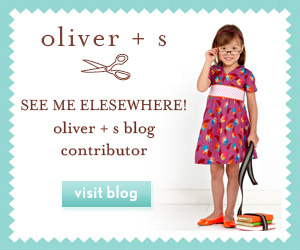 Just found your blog… came for the flashback tee, stayed for the Amelie dress. Saw this one and had to comment – I love this outfit to pieces. 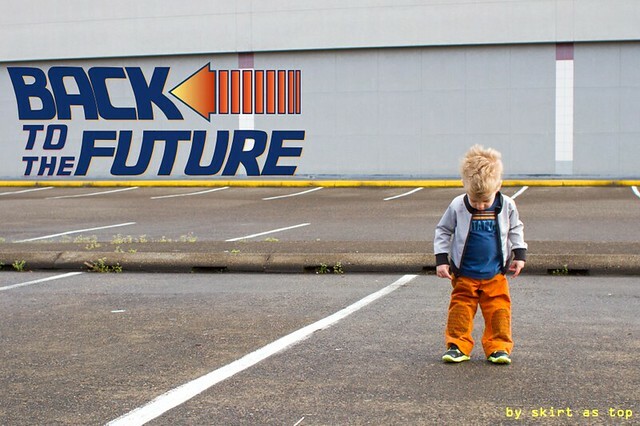 And “when this baby hits 88mph… ” HAHA excellent.